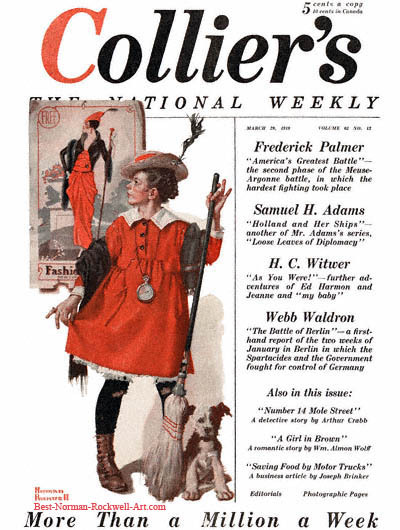 The Little Model, this Norman Rockwell painting, appeared on the cover of Collier's published March 29, 1919. This was the second cover by Rockwell to appear on Collier's and the second of four in 1919. Only four Rockwell covers were published by Collier's, all in 1919. Rockwell only submitted to this smaller magazine after the publishers of more popular magazines had declined to publish that particular cover illustration. The original oil on canvas painting, 30 x 16 inches or 76 x 40.5 cm, is part of a private collection. on page 14 of Norman Rockwell, A Definitive Catalogue by Laurie Norton Moffatt. This young lady is enjoying a nice game of pretend. Only she and her dog get to play this time. Actually she looks to be a housekeeper. She wears a short dress suitable for housework. Her stockings have had the knees worked right out of them. And her boots look well worn. Her hat is old and worn. Another giveaway is the broom in her hand! She is no stranger to work. At this moment, however, she is a fashion model. Rockwell has posed her in almost exactly the same posture as the fashion model on the poster behind her. In her mind, her work dress has become an evening gown, her old hat a fashionable cap, her work boots a pair of high heels and her old shawl a fur drape. Her broom has been transformed into a decorative walking stick. Her dog appears to want her to quit daydreaming and start sweeping, so he can once again harass the broom. Imagination is a powerful force. Rockwell gives us a glimpse into its light side. Norman Rockwell conveys this simple scene to us in this illustration just as clearly as if we were standing there watching it unfold before us. The owner of this original painting carried it to have it appraised at the Antiques Roadshow episode of January 22, 2012 in Eugene Oregon. No monetary figure is noted in this video, but he appears very pleased with the estimate, which the PBS notes as $500,000 USD replacement cost. The appraisal was given by Nan Chisholm. He also states that his wife has a letter to his mother from Rockwell dated from 1971 stating that he estimated the value then at between $10,000 to $15,000 USD. Quite a gain! The painting came into his family as a gift from the artist himself. His great-grandmother was Norman Rockwell's aunt. You can watch the appraisal here.